The MIA TUFF™ RPH-1 Rubber Powered Heli is a remake of a great early MIA Rubber Powered Helicopter Kit but made even better with today's modern lightweight materials. The original version was designed back in the early 80's by MIA, from balsa and tissue. The Current 2018 version is done from Carbon and Ripstop with carefully designed lightweight 3-D Printed Parts and lightweight Poly Blades for Performance and High Durability. YOU WILL NOT BREAK THIS MODEL as you you would a Balsa One. This model is designed to take a lot of abuse, as part of the trademark features of MIA Products, while not hindering user from the simple free-flight rubber hand wind up FUN! You can fly this model anywhere! anytime! but suggest an open backyard, field or park. and operation of this model. USER ASSUMES ALL RESPONSILIBITY. The Tough as Nails Kit comes with MIA's typical "Kit Contents Checklist", which ensures that the kit has been shipped complete. It includes all the pieces precut and pre-manuactured for ease of assembly. 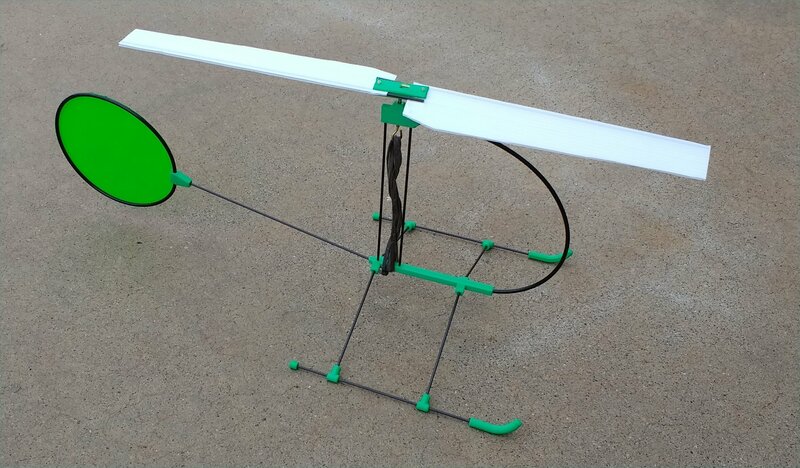 This Rubber Powered Heli Kit comes as a "Press-Fit Kit" and requires assembly with a bit of Hobby Grade CA, Light Hot Melt Glue or Goop supplied by the User. Build time depends on user skill, but should take you no more than 10-15 minutes. if you follow the Step by Step Instructions, provided with the kits. The assembly follows this sequence: Frame, Skids, Boom, Tail Fin, Rotor, Blades. The Tail Fin is not glued to allow it to pivot for different flight patterns. Should you have any questions, during the assembly and setup, Mario I. Arguello (MIA), the designer, is available for technical support via our Contact Us page. or a fun Land Yacht to run, when it is too windy to fly? Let's Build or Go Run Something Cool! Site content, product specifications, availability and prices subject to change without notice.